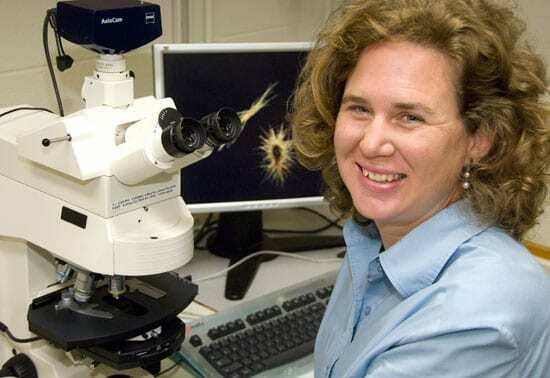 A new study of microscopic marine microbes, called phytoplankton, by researchers at Woods Hole Oceanographic Institution (WHOI) and the University of South Carolina has solved a ten-year-old mystery about the source of an essential nutrient in the ocean. Roughly a decade ago scientists discovered a rare form of organic phosphorus in marine organic matter. Not only were the researchers surprised to find this form of phosphorus, called phosphonate, but the concentrations in which it was found were very high, throughout the ocean. Scientists hypothesized that phosphonate is produced and consumed in the ocean, but no one understood where it came from and why it was so abundant. Enter Trichodesmium. In 2006, WHOI biologist Sonya Dyhrman along with other WHOI colleagues initiated a field and laboratory study with this phytoplankton group, which is plentiful in low-nutrient warm tropical and subtropical waters. They discovered that Tricodesmium uses phosphonate to fuel its biological processes, including the fixation of carbon and nitrogen. Their finding was unexpected because, chemically, phosphonate has a very strong carbon-phosphorus bond that requires a lot of energy, and a special set of genes, for Trichodesmium to break. But Dyhrman and her colleagues’s discovery that Trichodesmium could use this form of phosphorus to support carbon and nitrogen fixation still didn’t solve the basic mystery: where were the high concentrations of this rare compound coming from? 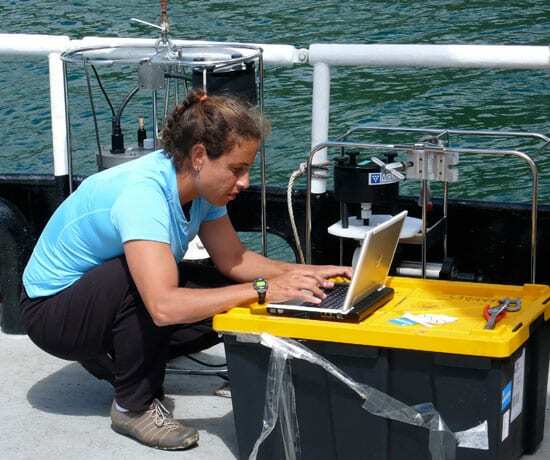 Now, a study newly published in Nature Geoscience by Dyhrman and her colleague Claudia Benitez-Nelson, a marine geochemist with the University of South Carolina, has solved the long-standing mystery. “After culturing several different kinds of phytoplankton and analyzing them using nuclear magnetic resonance (NMR) spectroscopy, we found high concentrations of phosphonate in cultures of a specific Trichodesmium species – in fact an average of 10 percent of the cellular phosphorus is in the form of phosphonate. Ten percent may not sound like much, but this is the most phosphonate ever detected in a marine microbe,” said Dyhrman. They selected many species of phytoplankton, grew them under different conditions in the laboratory, and then collected the cells onto filters. The filters were dried, and then analyzed by NMR. 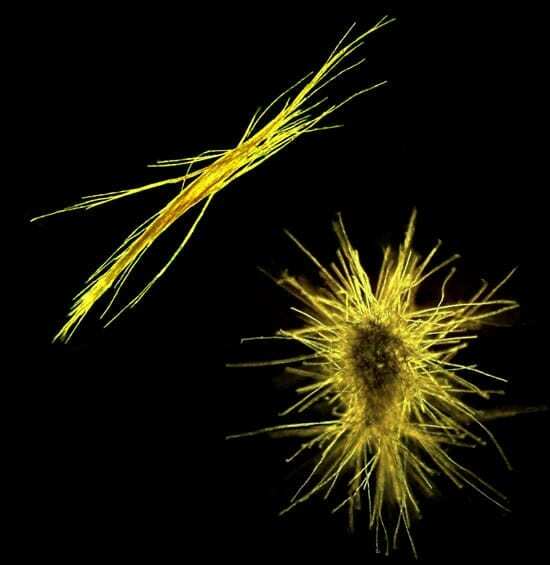 “When we first saw the phosphonate peak in the Trichodesmium culture, we were stunned, after a 10-year mystery it seemed ironic for Trichodesmium to both consume and produce this compound. We ran it again. We grew them under different nutrient conditions and, sure enough, the results were the same,” said Benitez-Nelson. Trichodesmium plays an important ecological role in both the global carbon and nitrogen cycles. Like other phytoplankton, it photosynthesizes, drawing carbon dioxide out of the atmosphere to supply the Earth with oxygen and transforming carbon into a solid compound. Even more impressive, Trichodesmium can use nitrogen gas from the atmosphere and transform it into a compound that other organisms can consume. Because the open ocean is nitrogen-barren, nitrogen fixers such as Trichodesmium are critical to the marine food web, supplying nutrients, and stimulating more phytoplankton growth, which in turn moves more carbon and nitrogen through the food web. This study determined that Trichodesmium transforms a percentage of all dissolved phosphorus into phosphonates – which is not readily consumed by other organisms. Living in low-phosphorus environments, this gives Trichodesmium a potential advantage over its competitors and, as nutrient supplies to the ocean change with climate, could shift the composition of phytoplankton communities in the ocean. “Not only does this solve a mystery about where these forms of phosphorus are coming from, but the fact that it is Trichodesmium has ramifications for how the phosphorus cycle is linked to the cycling of carbon and nitrogen and how those cycles will function in the future ocean,” said Dyhrman. There is a lot yet to be learned. “If we don’t understand what kinds of phosphorus are present in the ocean, we have no hope of predicting to what extent marine phytoplankton will sequester carbon in the future ocean,” said Dyhrman. As ocean surface waters warm, scientists expect even greater limitations on the nutrient supply, particularly phosphorus. This could drive the production of phosphonate and the use of phosphonate as a phosphorus source. For Trichodesmium, which can use phosphonate, this scenario could be beneficial, and, for humans concerned about climate change, it could enhance the extraction of carbon from the ocean. However, Dyhrman and colleagues warn, if the phosphonate used by Trichodesmium is a methylated form, it could produce methane – a powerful greenhouse gas. It is an interesting wrinkle that will be the focus of future research. This work was funded by the National Science Foundation and WHOI. 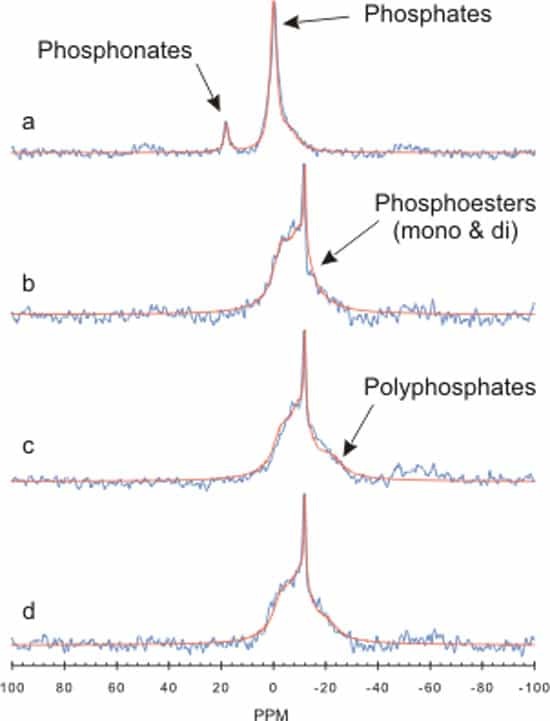 Nuclear Magnetic Resonance spectra from cultures and field populations of N2-fixing cyanobacteria denoting phosphorus (P) bond classes. a–d, A representative spectra from Trichodesmium erythraeum indicates the presence of phosphonate in this species (a), but a spectra from Crocosphaera watsonii (b), a spectra from a culture of Trichodesmium theibautii (c) and a sample of Trichodesmium spp. collected from the western North Atlantic (d) are missing this peak and thus lack detectable phosphonate. The arrows indicate peaks for phosphonate, phosphate, phosphoester and polyphosphate as marked.